After mother nature swept the previous weekend of NLRA series action, Mike Balcaen and Brad Seng put there names in the win column during the first series races in nearly a month. Mike Balcaen, driver of the No. 10 Northstar Canada Victory Circle parked in victory lane at River Cities for the first time since September 2, 2011, after defeating Pat Doar and Brad Seng last Friday night. The win is Balcaen's 21st NLRA series victory, at the time re-tying him with Brad Seng, who picked up his 21st series win on May 25th at the Viking Speedway in Alexandria, MN. Seng, driving the No. 12S S&S Transport Mars MB Custom, started on the outside of the front row, and jumped out to an early lead. Seng held the lead early on despite a myriad of cautions that plagued the event early on. Seng's good friend Pat Doar put his No. 11 Speedwerx Capital to the point on lap 13 before Balcaen took the lead for the next 3 circuits. Doar then regained the top spot for the following four laps, until Balcaen secured the final lead change on lap 20, and lead the remainder of the event. Ricky Weiss in the Derrick's Sandblasting No. 7 started 13th and charged up to the runner up spot, while Doar, Seng, and Steve Anderson, driver of the No. 9 Hi-Per-Flex Panel Systems Pierce rounded out the top five. Dave Smith finished sixth in the No. 06 Mobil 1 Capital with Shane Edginton driving the Avonlea Group No. 5E coming home seventh. Bill Mooney, in the No. 2 Lithia Toyota/Pizza Ranch Rocket crossed the line in eighth, with Zach Naastad, in the No. Z17 Q&Z Plumbing & Heating Millenium completing his night in the ninth spot. Donny Schatz in his No. 15 Petro of Fargo Rocket completed the top ten and was the races' hard charger, coming from 23rd after winning his 153rd World of Outlaws Sprint Car main event. Anderson, Balcaen, and Seng were the heat winners. 23 cars were in attendance. Last Saturday night the NLRA headed east to compete for the third time ever at the Hibbing Raceway. Brad Seng took the lead at the start and lead every lap, capturing his 22nd career NLRA feature victory. The win gave Seng sole possession of second on the all time wins list. He now sits four wins shy of tying the late John Seitz, who won 26 NLRA main events in his career. Pat Doar finished second, while Hibbing regulars Bobby Carlson and Zach Wohlers put up strong runs on their home dirt, finishing second and third respectively. Ricky Weiss rounded out the top five. Shane Edginton finished sixth, and defending NLRA champion Dustin Strand, driver of the No. 71S Q&Z Plumbing & Heating Millenium came home seventh. Harry Hanson, Chris Olson, and Mike Balcaen completed the top ten. Dave Smith was the hard charger moving up from 25th and finishing 15th. Greg Ferris, Strand, Doar, Seng, and Balcaen were heat winners, while Hanson and Kyle Peterlin won the twin consolation events. 35 cars were on hand. Series action continues Wednesday and Thursday June 25th and 26th at the Norman County Raceway in Ada, MN. Then on Friday night June 27th the series makes its' debut at the I-94 Speedway in Fergus Falls, MN, before ending a four race stretch on Saturday night June 28th at the Viking Speedway in Alexandria, MN. 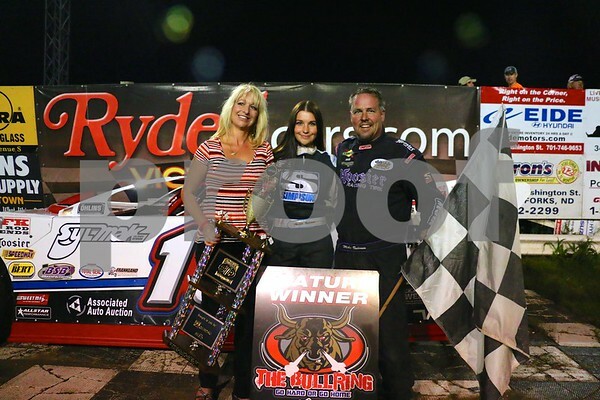 Mike Balcaen in victory lane last Friday night with wife Kim (Left) and daughter, and NOSA sprint series regular Amber (Center), who was fresh off her World of Outlaw debut. Photo courtesy of Rick Rea.